This book, especially for a first mystery, was completely enjoyable. It takes place in an academic setting (something I almost always like), and it’s essentially a locked-room mystery: the President of St. Anthony’s College has been killed, and owing to a peculiarity of the college grounds, only the fellows of the college can be considered as suspects, because only they had keys to the area. Of course, as it turns out, only these men had motive, and it’s up to Appleby, whom I found entirely winning, to have the patience and the wit to untangle their secrets. Innes’s writing was excellent. In this mystery, he’s erudite almost to a fault — you could call it a little bit donnish — and I sometimes find locked-room mysteries to be a trifle dry. But in fact, Innes himself was a don, who taught at Oxford, Leeds, and the University of Adelaide, among other places, so you have to forgive him that. There’s also a strong sense of whimsy (not Wimsey, though) and humor that pervades the novel. For instance, there are three undergraduates, readers of detective novels, who take it upon themselves to solve the crime. After several farcical episodes, they deliver the person they believe to be the murderer to Appleby in a wicker basket! This kind of thing, along with Appleby’s personality, really leavens the slightly too-clever-for-its-own-good plot. This wasn’t Sayers, by a long chalk, but it had a lot to offer. I have a strong feeling that further reading with Innes will be well worth the trouble. Thank *you* for the book, Elaine! I’m looking forward to more Appleby! Good news! I’ve had an Innes on the shelf for ages, and you remind me I must get around to it. I love fitting mysteries in between bigger book projects. It’s not a big emotional investment, you know? Just mental fun. And great to find an author new to me, who had written so many books! I love mysteries from this era, even when they’re not Sayers (and they never are!) A new author for me…will add this to my list! Thanks for the recommendation … and happy new year! I love mysteries . Thank you so much for the review! New addition to my TBR! Glad to add to your pile! Let us know what you think! 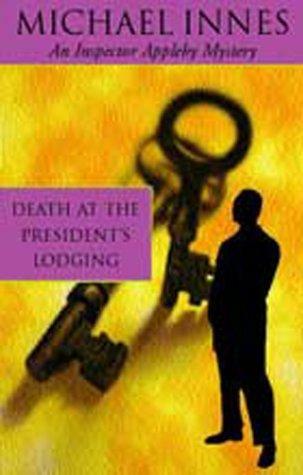 Thanks for another new Author.I’ve only resently found these great mystery writers. I’m trying Patricia Wentworth, Josephine Tey, Carola Dunn, Margery Allingham so far have enjoyed them all. Mysteries have never been high in my list of reading. I used to read nothing BUT mysteries! I’ve moved on to other genres lately, but I still like to fit them in when I can. Good ones can be hard to come by, so this was a great find! I really enjoy Michael Innes and I think his later books are even better than his earlier ones. His J.I.M. Stewart books are well worth reading too and of course – he’s Scottish. Thank you so much for the recommendations — I’m really glad to know I have even better to look forward to. And being Scottish is always a Good Thing!